Our toddler classroom ranges in ages from 18 to 30 months. Toddlers are curious and their curiosity should be fed. This is how they learn. Our program allows them to discover the world in which they live. The young explorers develop budding skills, such as fine and gross motor coordination and visual discrimination, through the senses and learning materials. The prepared environment will aid the toddler in the development of language, practical life, sensorial, and music and movement. Our curriculum focuses on introducing learning to the children while giving them social interaction with other children their age. As they build relationships with other toddlers, they learn the give-and-take of life through sharing and being part of a group. Each classroom is consisted of twelve toddlers to two teachers (a ratio of six to one). Each classroom is equipped with a toddler toileting area to encourage beginning training and bathroom independence. Children must be 18 months to enter but advancement to our Primary program is based on the individual child’s readiness. Readiness is determined by toilet training, as well as self-feeding and listening and verbal skills with the ability to follow directions. 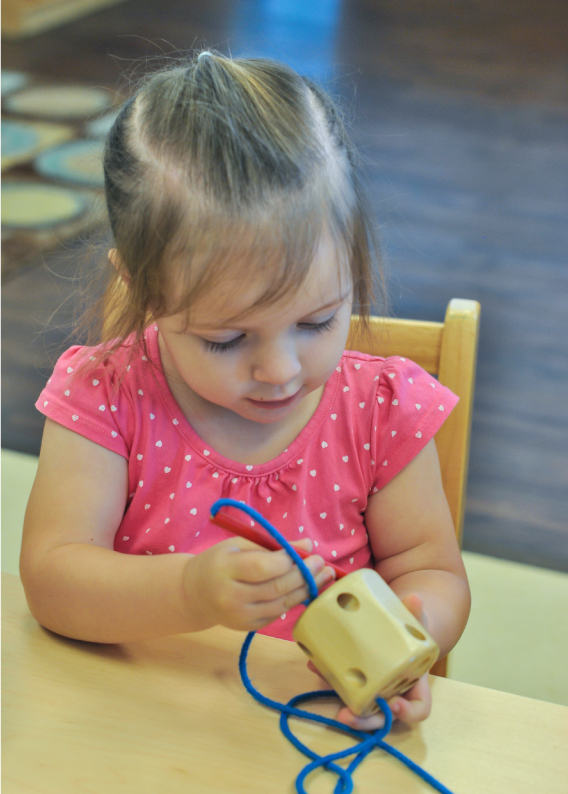 By the end of this program, your toddler is well prepared for advancement to the Primary classroom.